Readers of ETM publications give MAN Truck & Bus three winners in "Best Commercial Vehicles of 2013": the TGL and TGS in the new Euro VI generation and the NEOPLAN Starliner. MAN Service Complete rated No. 2 among the "Best Brands of 2013" in the category "Truck / trailer service". For the 17th time in succession, readers of "lastauto omnibus", "trans aktuell" and "FERNFAHRER" were called on to choose their best commercial vehicles. All major delivery vehicles, transporters, trucks and buses on the German market were represented. More than 10,000 readers of the three trade magazines cast their ballots, awarding MAN Truck and Bus an excellent result. In the class of tippers up to 32 tonnes, MAN TGS took first place. Similarly, the MAN TGL won the category "Transporters / trucks up to 7.5 tonnes". Moreover, the MAN TGX and MAN TGS were both second in the long-haul truck and distribution truck categories respectively. The MAN TGM took third place amongst the tippers, as did the MAN TGS in the long-haul truck segment. Reinhard Pöllmann, CEO of MAN Truck & Bus Deutschland GmbH, was very pleased with the company's showing: "Three winners and 14 placings overall for the vehicles and services of our MAN and NEOPLAN brands in the ETM readers' poll - that's a big success. It is a great acknowledgement of the image and efficiency of our products and rewards the successful endeavours of our Sales team." The showcase discipline amongst the buses - high-deck touring coach - was won by MAN's flagship, the NEOPLAN Starliner. In the intercity bus category, MAN came second with the Lion's Regio and third with the NEOPLAN Jetliner. Second place went to the MAN Lion's City in the segment of regular-service city buses, with the MAN Lion's City LE following in third place. In the vote for "Best Brands of 2013", MAN Service Complete was rated No. 2 in the category "Truck / trailer service". The "Rental / leasing" category saw MAN Rental and EURO-Leasing taking second and third places. 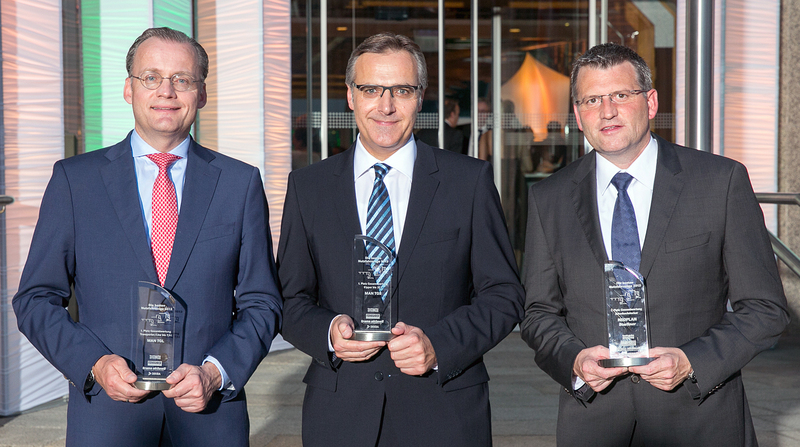 Happy winners with the trophies for taking first place in three categories (left to right: Arndt Stegmann, Head of Controlling, Reinhard Pöllmann, CEO, and Heiko Haumer, Head of Sales Management Bus, all MAN Truck & Bus Deutschland GmbH).